Here’s everything delicious about tangy BBQ chicken in a creamy, cheesy, hot, bubbly dip with caramelized onions to make for the perfect appetizer for a party or game day. 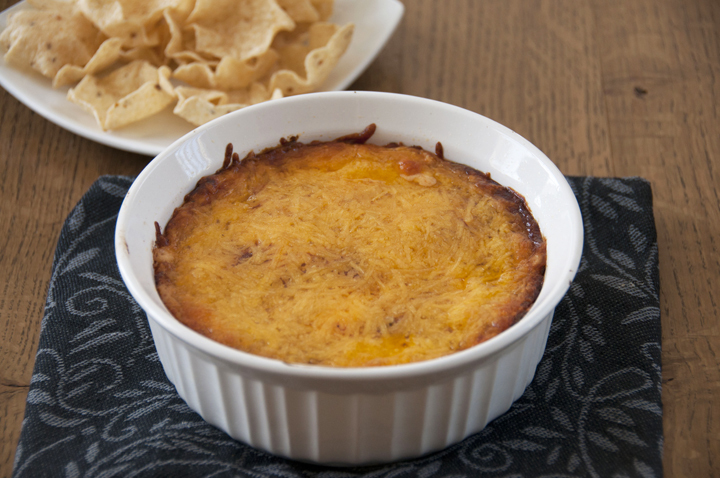 I wanted to just name this “the best dip in the world”…I really did. 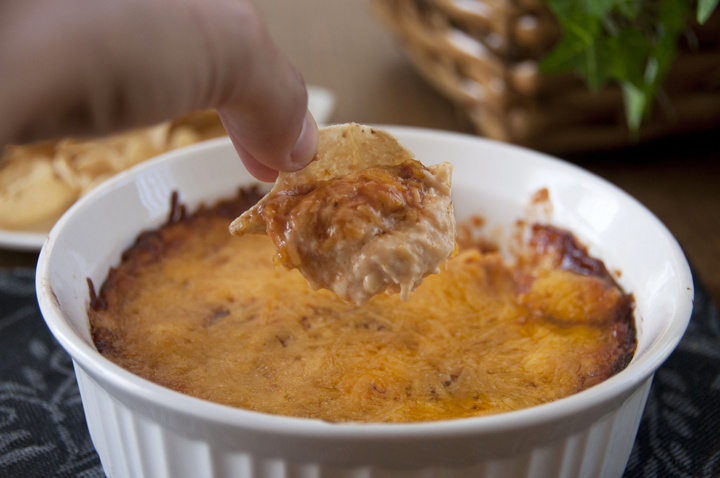 I have a slight chicken wing dip obsession and this BBQ chicken dip definitely added to it. I made this dip a few weeks ago and would just like to say that A) it was a hit at the church get-together I brought it to and B) it was one of the best things I’ve ever eaten. Needless to say, I went home with a clean dish that night! Everyone loved it, but I’d have to say that I loved it the most! I could seriously eat this stuff until I’m sick (and maybe I even did). If you want to make this even faster, you don’t have to butter roast the chicken – just poach it and shred it to save time and it will still be awesome. 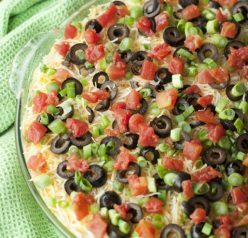 This was a wonderful alternative to buffalo chicken dip if you want to switch it up once in awhile and it’s different because it uses BBQ sauce instead of buffalo sauce. It would be the perfect, filling snack for any game day….whether your sport of choice may currently be football, hockey, or baseball (the Red Sox seriously need to stop winning games! Sorry Boston fans! #sorrynotsorry). 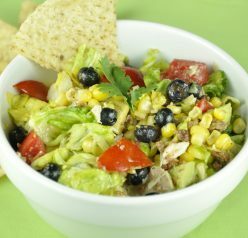 Serve this dip with fritos scoops, Club or Ritz crackers, or tortilla chips. Enjoy! Here's everything delicious about tangy BBQ chicken in a creamy, cheesy, hot, bubbly dip with caramelized onions to make for the perfect appetizer for a party or game day. Rub chicken breasts with softened butter then season with salt and pepper. Place on a baking sheet and roast for 30-40 minutes. Let cool completely then pull chicken off the bone into bite-size pieces. While the chicken is roasting, heat a skillet oven medium-low heat. Add olive oil and onions, cooking until soft, about 5 minutes. Add in brown sugar and cook, stirring occasionally, until caramely. Remove from heat. In a large bowl, mix together softened cream cheese, ranch dressing, ⅓ cup of the BBQ sauce, onions and half of the cheddar cheese. In a casserole or baking dish (mine was 8-inch round, 4-inch deep), layer the cream cheese mixture, smoothing the top off. Cover it with the remaining BBQ sauce, then the remaining cheese. Bake for 20-25 minutes, until bubbly and hot. It really is the best!! I do not lie! This sounds awesome! Can’t wait to try it. Oh man, this looks awesome!! Thanks, Jennifer! It really is! My husband and friends would love this at a party, great for upcoming holiday events! Thanks! I have to make a snack for my girls Bible study tomorrow night – making this for sure!!! Thanks for sharing! That’s exactly what I made it for – a Bible study! Wow, looks amazing and I love everything in it so I can imagine this really is the best dip ever! It most definitely is!! Thanks, Ruby! OMG I am in love right about now. 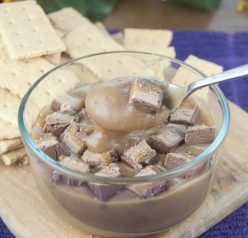 Oh bet this was a hit if no one was looking I would have licked the bowl if I was there… Gosh I am going to half to make this for football season.. Beautiful recipe.. This recipe is one of those dips that will last about five point five seconds in my house. It looks delish! That does look like the best dip ever! BBQ sauce and ranch are two of my favorite things ever. Oh yum! My brother in law is coming to visit this weekend and he loves BBQ Chicken wings. I can’t wait to make this for him! OH he’ll definitely love this then! I think this really might be the best dip in the whole world. Look at all of the melted cheese and flavors to layer on my corn chip. you just need a bigger corn chip! Maybe even inside a taco shell…thats a teenager size snack. Already pinned…and thinking of actually making this to a gathering we’re going to on Sunday. Perfect! I love that this dip is homemade! I bet it would go so fast while watching football! They look delicious Ashley! I love a good dip. It’s so hard to resist that gooey cheesy goodness. I can eat this entire bowl myself! 😉 Have a great Wednesday! Dips are basically my life. I need to try this one!! You’ll love it – I promise! Oh my goodness — This looks so, so good!! Amazing! Now that’s a tasty sounding twist to onion dip! Really interesting idea! I’ll bet this has wonderful flavor. Love the idea – very creative. Thanks! Thanks – it really does! Gonna try this tonight!! Maybe add a little sour cream and hot sauce? What you think? I think that sounds delicious!!! Let me know how you like it! Preety damn good dip, i guess i’m gonna be please as a guess in your party! I keep meaning to come back to this recipe and read it. I’ve finally had the chance and of course I might as well just apply these to my stomach because I’d eat the whole batch myself. Forget about sharing it. Great recipe – perfect for the World Series!